If you’ve followed me for any length of time, you probably know that I recently expanded my business to add teaching Zentangle® classes and selling Zentangle® products. 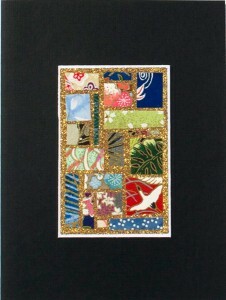 I attended the Zentangle® Teacher’s Certification program in Providence, Rhode Island last April and began teach in May. Since that time, several of my Chiyogami Mosaic enthusiasts have asked if I’m giving up Chiyogami Mosaics, so I wanted to clarify how my business is evolving. 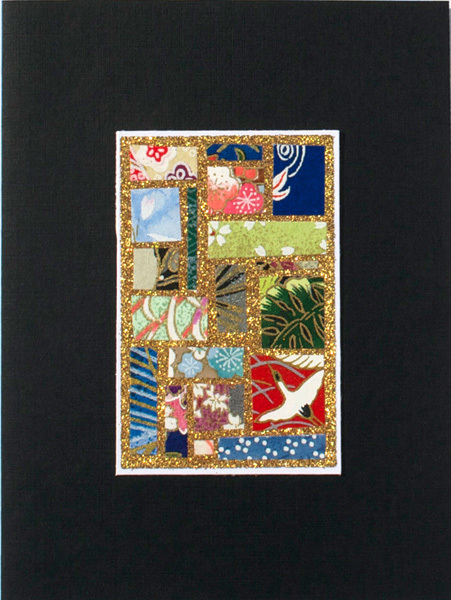 Rest assured, I am not giving up Chiyogami Mosaics! What I am doing is finding ways of doing business closer to home. I started doing a lot of shows in 2012, with most of them being a good two hours’ drive from my home. Several were in Southern California, and I even went to Las Vegas. I was gone a lot, and I missed a lot of gatherings with people who are near and dear to me. I especially missed Eric, my sweetie, and I missed my dog Gracie, too. What Goes Into An Outdoor Show? 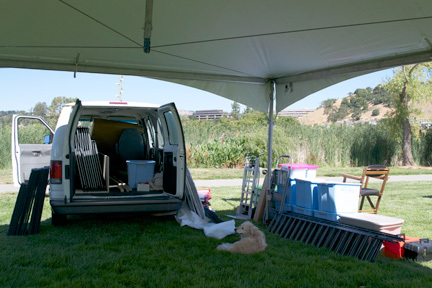 Have you ever wondered what goes into setting up a booth for an outdoor show – or any show, for that matter? 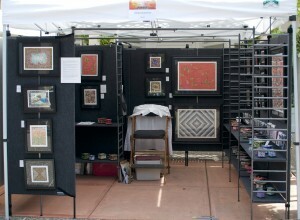 Whether indoors or out, the booth usually looks the same. However, there are some challenges inherent in outdoor shows that make them much more difficult and stressful than indoor shows. For starters, the vast majority of outdoor shows require setup the morning of the show itself, whereas indoor shows typically allow for setup the day before. So, for an outdoor show that starts at 10:00 a.m., a vendor ideally would be set up by 9:30 because many folks arrive early. The early shoppers tend to be serious shoppers, so if you snooze, you lose. What does it take to create your art fair space? Every now and then, a conversation with art fair visitor in my booth will turn to setting up for the fair itself. Visitors are often surprised to find out that when we (the exhibiting artists) show up at the site, our space is completely barren. They express shock that everything they see in our booth, including the booth itself, was hauled to the site, set up in the wee hours of the morning (most of the time, we’re talking on site to begin setup at 5:00 a.m.), and ready to go by the festival opening (9:00 or 10:00 a.m.). That includes everything in the space that you can see, and some things you can’t (like our storage stashes). Earth Day At Montgomery Village! It was a truly lovely day on Saturday, April 13, in Montgomery Village. It felt like Spring had sprung, and that it was here to stay. 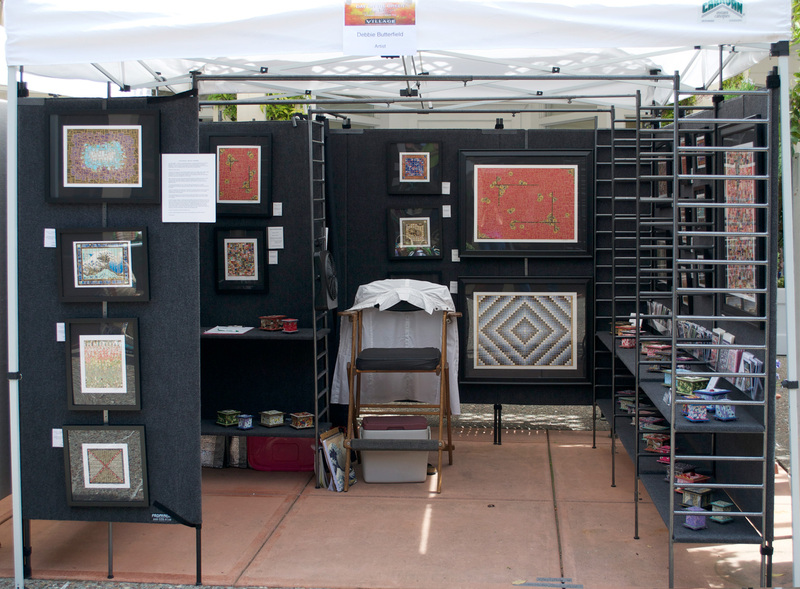 And there I was, in my new booth, and it was my first event of the 2013 season. The music was exquisite! Sarah Baker played most of the afternoon, and I sat in my booth, in the springtime warmth, savoring a soft breeze, soaking in her wonderful music. Several of my friends stopped by to see me – some had planned the visit because it is one of my few local events this year. Others came to shop and were surprised to find me there. I enjoy surprising them! It’s always fun to do these local events. I never know who is going to show up. 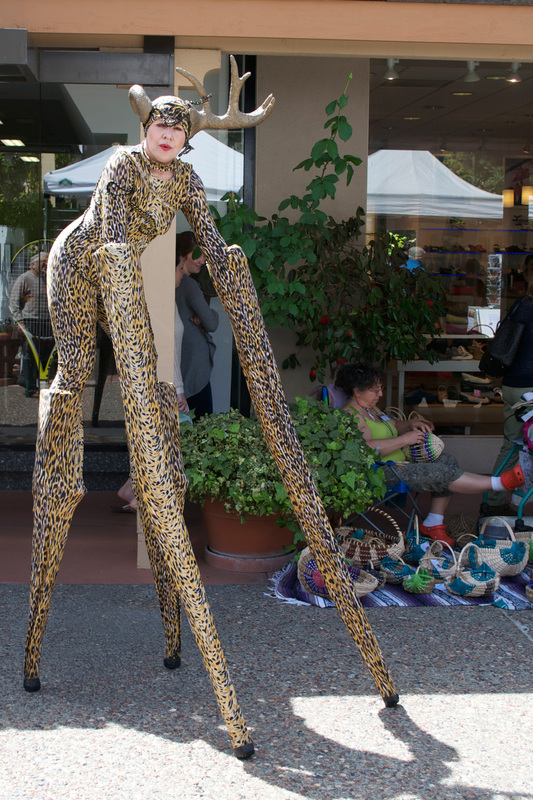 One of the highlights at this event was Pam, the woman on stilts. She never fails to surprise and delight me. Her costume creations fascinate and inspire me – where does she come up with her costume ideas! She has such creativity. And there is truly something magical that she brings to these events – I can’t help but stare at her, so amazingly tall, walking among mere mortals with grace, style and ease. She makes it look so easy that … well, honestly I’m not really tempted to try it. She just makes it look easy! This is the first costume she wore when she glided by my booth like a gazelle. She looked like a leopard, and she was most gracious to post for this photo. I realized after she left that I had missed a perfect “product placement” moment with her and the store behind her, and I vowed to capture it the next time she happened by.